Create a full site backup before your start (database and all the files). It's crucial this time. Our support team is ready to help if something goes wrong (the support team work Monday to Friday only). Go to WP Admin > Plugins and disable all the third-party plugins. Try to schedule backup on the day and time when you have not so many visitors. It will take you 10-30 minutes to complete the update, but there is a risk of a delay if some of the plugins fail to update properly. Please, make yourself a cup of coffee and follow the next instructions. Please don't forget to create a backup first! 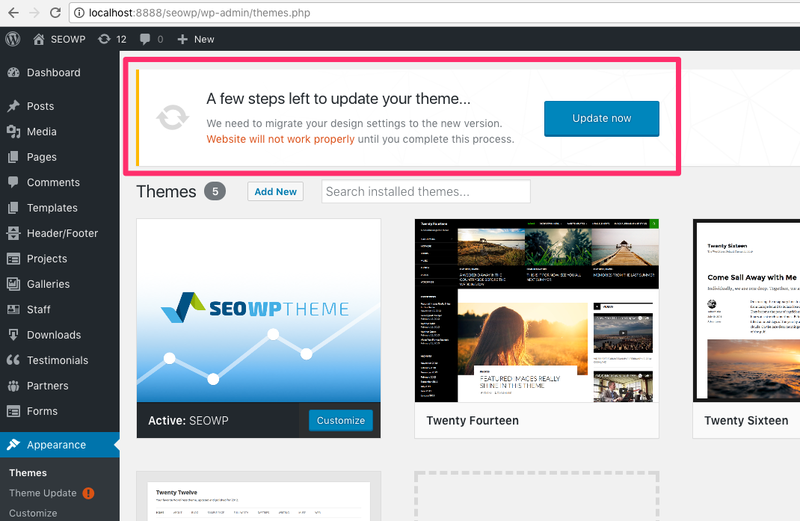 Go to WP Admin > Appearance > Themes and activate a default WordPress theme. 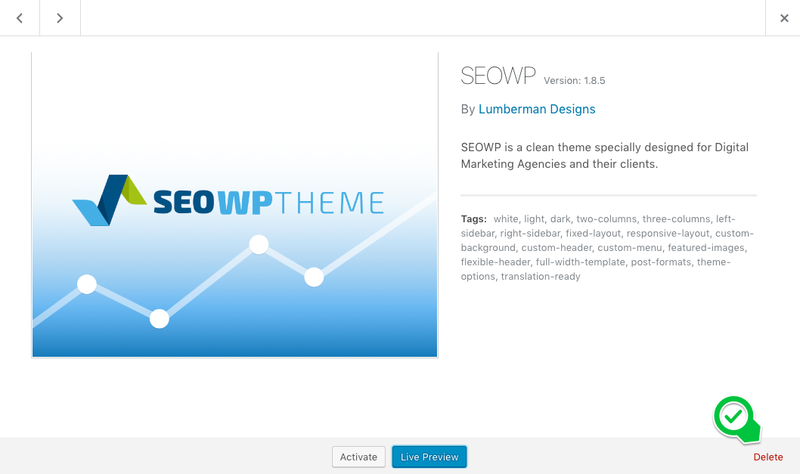 Click on the SEOWP theme thumbnail and then on the "Delete" button. Upload and activate the last theme version. Click on the "Update now" button. This action will lead to the theme installation config panel. Please follow each step! Yay, you did it! You completed the most stupid and complex theme update ever. Sorry to make you struggle. You deserve a second cup of coffee! We will get you surprised with what we prepared for SEOWP users! Make sure to subscribe to our newsletter to not miss new big release. BTW why not to tell us about features or designs you want to see released? No promises, but we do listen to our lovely clients. If you follow the steps described above you should have no issues, but we will not get angry if you ask our support heroes for help. HostGator hosting company by default block all the outgoing connections on the client's websites. Because of this restriction, our theme can’t download all the images from the demo website. Before installing our theme, please contact HostGator support directly with a request to whitelist the Mod_Sec rule 1234234. After that, the theme installer and demo content importer will be fully functional on your website.